With Rockstar silent for over a month since Grand Theft Auto V's [delayed] release date was revealed, we might as well answer some of the GTA 5 questions fans have been asking us in another edition of "Frequently Asked Questions". We'll tackle some rumors and summarize what we know about GTA 5 so far. Keep in mind some of the questions fans have been asking are still hard to answer at this time with the amount of information we have so far, but if you have any questions you'd like us to answer, you can Tweet Us (@iGTA5), Facebook us (iGTA5), create a comment below or send us an email (submit[at]iGTA5.com). Finally we can say that yes, there is a release date for Grand Theft Auto V! If you have been living under a rock the past month, Rockstar Games confirmed the game would miss the Spring 2013 window and instead release on September 17th, 2013. You can find a countdown timer on our homepage, release date page, and at the top of the forums. Why was GTA 5 delayed? 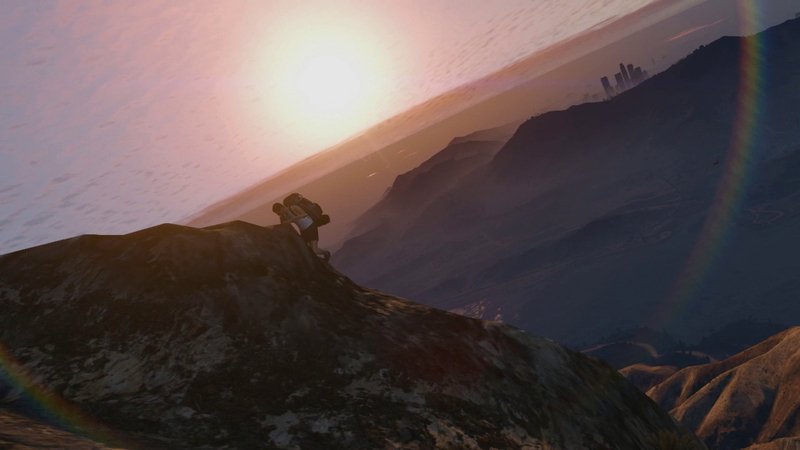 Rockstar wants more time to iron it out and make Grand Theft Auto V the best it can be. This isn't to say it won't be bug-free (every game has some issues) but the extra few months mean more time to minimize bugs of a very complicated game. So much can happen at any given second during GTA gameplay so any number of things can go wrong. Check out other GTA 5 characters here. Is there split screen or co-op for the story? No, there will not be split screen or co-op of that sort. Online multiplayer will likely feature some co-op modes, though. Quite a few animals have been spotted so far. Dogs, cows, and even sharks will feature in GTA 5! How big is the GTA 5 map? "Just how big is this world? Art director Aaron Garbut crunched the math. When you include interior and exterior spaces together, Los Santos is bigger than the worlds of Red Dead Redemption, San Andreas, and Grand Theft Auto IV combined, with room to spare." Hopefully it doesn't go by too quick while screaming across the skies in a fighter jet. There are tons of landmarks and other real buildings to spot too! What is there to do in GTA 5? Aside from changing protagonists and the usual theft of automobiles there will be plenty to do such as SCUBA diving, in-game TV/internet/radio, triathlons/tennis/golf, and the most epic of all: yoga... You'll be able to call up your friends to participate in these activities including the other protagonists. There will not be a dating system, though. You will be able to change clothing but RPG elements like fat gain will not return. The characters have a certain story and extra trips to Cluckin' Bell or Los Santos Dialysis will not be a part of it. It is still unknown if car customization will return or if GTA IV's vehicle "variants" will be the most we'll get. Will GTA 5 be on PC or Wii U? Still no word on a PC version yet but as we've been saying, that will likely change in the near future. Hopefully with the console delay the PC release will be a little closer. We can only guess at what the PC specs for GTA 5 will be. There have been no hints of a Wii U release either aside from it being "up for consideration" but let us not forget a certain CEO's skepticism about GTA and other mature titles going Nintendo. Will GTA 5 be on PS4 or the next Xbox? Rumors of the next PlayStation and Xbox making their debut have been circling for the past year or so. When Rockstar delayed GTA 5 some fans worried it may have been pushed onto the rumored next-gen consoles. These fears worsened when Sony held a largely publicized meeting on February 20th which was all about the PlayStation 4. Sony announced plans for a Holiday 2013 release - GTA V coming out in the Fall right before. We can say for a fact that GTA V will release on the PlayStation 3 and Xbox 360. It would be silly to throw away the work put into them the past 5 years. But will GTA 5 be on the PS4 when that console launches? Very doubtful. Even with the PS4 said to be much easier to program, Rockstar is still busy with GTA V on the current consoles. Creating the whole game on an entirely new platform would take much more than a year on its own. Dan Houser also knows that a new console won't have anywhere near the amount of users as the current consoles - Rockstar is still a business. Could these current-gen games get ported over to the next-gen later? It's possible but whether or not that will happen is a toss-up at this point. Even after GTA 5 drops there's still DLC to look forward to as well as the expected PC release - although the bulk of that work will probably be shoved off onto another studio such as Rockstar Toronto. It seems more likely that when Rockstar is done with GTA V, they will be done with it completely. There are plenty of other games to make (whatever is going on with Agent... another Rockstar North title in development for 5+ years) and the next-gen consoles will get a GTA of their own one day. At this time Grand Theft Auto V is poised to be Rockstar's last hurrah on this console generation. A good way to go out with a bang if you ask me. As always take rumors lightly and never download anything claiming to be a GTA V beta. There is no beta or demo. There won't be in the future either. All gameplay videos you may see on YouTube are fake. We hope you enjoyed this group of Frequently Asked Questions. Let us know your thoughts in the comments below and if you have any other questions you know where to send them. We'll try to answer more of them soon if we can! Until then, check out the GTA 5 info pages and join the many discussions in the Grand Theft Auto 5 forums! Will the cars on the road be more smarter with there driving skills and not switch lanes and hit you? Hopefully they've nailed the dodgy character movement which plagued previous GTA's. They should also have an option to switch to first person view when running around and shooting stuff, that would be especially useful in the online multiplayer mode. I am going to buy a console for this brilliant game if there is no PC release.I have played GTA since GTA III and I am not going to give up on GTA 5. I hope that most of the things in GTA 5 will be destructible and it's important for the level of fun we wanted to have. I want to know if game is coming on PC.I don't care if it's sometime after the consoles release but is it gonna come out for PC? GTA V Frequently Asked Questions (March 2013) - We answer some of the most popular GTA 5 questions to keep everyone up to date with the latest information and rumors.